We are committed to giving our patients the highest quality product available at the lowest cost. We use the same implant system that is used by most surgeons, NOT the knock off brands, but we have kept our implant prices as low or even lower than the knock off brands, so much that many are shocked by the price. made to match your natural teeth. There are 3 parts to an implant. The implant itself is a “screw” like post placed into the bone that is then left to heal for about 3 to 6 months. Most patients find this procedure to have very little pain. It is much less pain than having an extraction. During the 3 to 6 month healing period the bone will integrate with the implant. 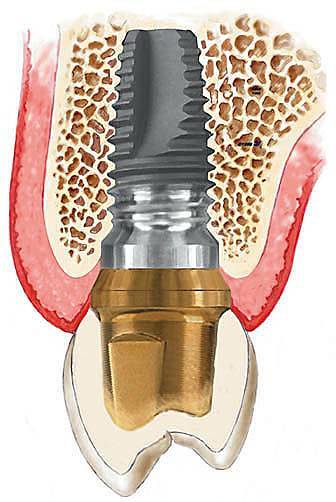 Once the healing process is complete an attachment called an abutment is placed on the implant and a crown is then cemented onto the implant abutment. When completed the implant looks, feels, and functions like a natural tooth allowing you to brush and floss as normal and eat your favorite foods with confidence and without pain. Dental implants can give back your smile and help you feel better about yourself. They are very durable and will last for many years. With good care, many implants will last a lifetime.